One of my favourite things to buy from eBay are unique but cheap makeup brushes! I have more than enough now but when they cost £1-3 it's hard to resist trying more! Here I have a selection of cheap brushes that I've only just come across and I'm so tempted by. Instantly when I spotted this small fan brush with it's wooden brown handle I was pretty sure it was a painters brush being listed as a makeup brush... however that's a good thing as some of the best fan brushes I have are from craft stores! For watercolours fan brushes have to be extremely delicate, making them ideal for powder highlighter on the cheeks and brow bone to give that natural yet defined highlighted look. On to a totally different kind of brush with this chunky kabuki that I could see being great for really blending in bronzer or to finish of your foundation with. This also looks really sturdy and good quality! One of the best recent additions to makeup brushes on eBay have been the pro oval style brushes and finally there are different colours instead of just black! 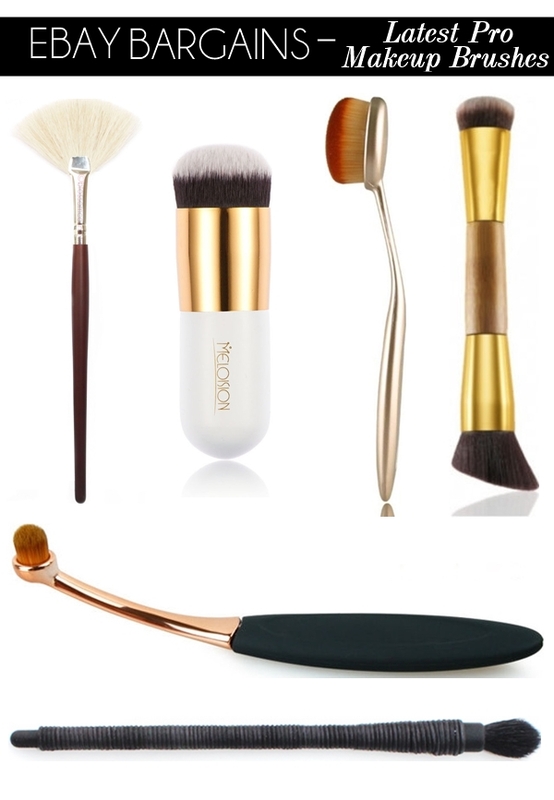 The above brush comes in a choice of gold or silver and is just perfect as a foundation brush or even to be used with cream products. Excited for this to arrive now! I love a good double ended brush and this particular multipurpose brush looks extremely like something you would pick up from Tarte for a lot less money. I have a few double ended brushes like this now and I've been pleased with all of them. Ahhh, my favourite find of this post! This is a rather aesthetically pleasing oval brush for such an amazing price! The listing contains 6 other sizes from only £1.14 - £2.96 for the largest brush. These really do look amazing for the price. Of course picked up quite a few of these! Finally I have a lovely wrapped kabuki style eyeshadow brush that's again amazing value for money. I already have the wrapped kabuki blusher version of this which is a Nars dupe and I love it. Hopefully this will be just as good. Really hope you've found some brush bargains here!